In a recent quantitative analysis of the past 40 years of terrorist activity in New York City, the FDNY’s Center for Terrorism and Disaster Preparedness identified several trends in terrorist activity that may have value to future policy formation, both in New York City and in similar municipalities elsewhere. This article will discuss this study, which involved the compilation and analysis of relevant data on all terrorist activity in New York City from 1975-2015, including the specific location of terrorist activity, attack motivation, group affiliation, and weapons used. The success of this study in distilling actionable intelligence from a data set assembled exclusively through open-source research serves as an example of the emerging importance and applicability of quantitative data analytics for the field of Homeland Security. Cities are the economic, social, and cultural centers of our world. They are crossroads of transportation and hubs of education, commerce, arts, and industry. Nearly four billion people call a city their home and millions more commute to one for work. Unfortunately, cities can also play a darker role, one that is inextricably tied to the bustling masses teeming through their streets: a city is the perfect target. In addition to the crowds of potential victims, the many amenities a city provides can also be an attractive spectrum of targets for a terrorist attack; seats of government, financial centers, symbolic treasures, and transportation hubs are all available marks that would meet the grisly goals of any terrorist. Considering this perspective, perhaps there is no target more enticing than the most global of metropolises, New York City. The mention of terrorism in New York City reflexively evokes images of the horrors of the World Trade Center attacks on September 11th, 2001. The incomprehensible enormity of these attacks can never be overstated. However, to get a better sense of the reality of terrorism in New York City, it becomes necessary to look deeper than these horrific images, to the dark history of terror that New York has endured over the past decades. It is a history rife with a variety of attacks – several different weapon types used, a number of different motivating causes, and a lengthy list of terrorists responsible. From the explosive chaos of the turbulent days of the 1970’s, through the carnage of 2001, to the post-9/11 world of today, the threat of terror continues to be present in the discussion of public safety. But while the danger has remained, the world has changed drastically over these years; the New York of the 1970s was a very different place than the city of today. Likewise, the threat of terrorism has evolved. Today’s terrorists are not the same as terrorists in the past – they behave differently, they believe different things, and they attack differently. By identifying and understanding these differences, the homeland security community can best prepare to face the continuing threat of terrorism as it evolves in the 21st century. It is only through a deeper understanding of this history that it becomes possible to discern the ways in which terrorism is evolving. By painting a clear picture of where we came from, we can hope to bring some clarity to what we, in the counterterrorism field, might be faced with next. Such a picture can best be achieved by looking objectively at the specifics of past attacks, in the hopes that such insight can help anticipate details of the attacks that are yet to come. Considering today’s amorphous threat environment, any information concerning terrorist tactics, weaponry, motivation, or location would be an asset to responders and policy makers alike. In order to gain such an objective perspective, it is necessary to leverage the strengths of the myriad collections of electronic data that have become available recently. Through quantitative analysis of available data, it becomes possible to distill useful information that can be a vital tool in helping experienced public safety practitioners continue to craft effective counterterrorism policies and procedures. This article will discuss one such project: a recent quantitative analysis of the history of terrorist activity in New York City conducted by the FDNY’s Center for Terrorism and Disaster Preparedness. The analysis focused on the most recent 40 years of the city’s history and included all terror-related activity that occurred between 1975 and 2015. As the following sections describe, the analysis revealed several significant trends in the data, which could prove valuable in policy formation moving forward. The first step in the project involved the compilation of data points. The vast majority of information was taken from the University of Maryland’s National Consortium for the Study of Terrorism and Responses to Terrorism (START) database1 and further research (mostly concerning geographic location) was conducted for each attack. All information was accessed through open-source resources available to the public, including and especially reports published in mass media. While the sources varied for each of the 236 incidents, electronic news archives for the New York Times and the New York Daily News were the most commonly used sources. These media reports were primarily used to confirm the exact location of the incident for the purposes of creating an interactive map of the attacks as part of a training initiative. Any qualitative data gained from the media was corroborated through additional sources, as early media reports can often be inaccurate. The availability of reliable media sources proved to be a limiting factor to the time period investigated in the study, as reliable data on attacks that occurred before 1975 proved difficult to obtain, thereby eliminating earlier attacks from investigation. In defining “terrorism” and thus setting the parameters for which incidents would be examined, the study again used START as a foundation, which primarily defines terrorism as “the threatened or actual use of illegal force and violence by a non-state actor to attain a political, economic, religious, or social goal through fear, coercion, or intimidation.”2 Based on this definition, START’s data set was expanded to include any omitted relevant local activity within the borders of NYC, such as terror-related arrests. Outcomes for three of the five variables investigated were classified into several discrete categories, so as to make meaningful analysis possible. The variables investigated are listed below. Bullet points indicate the various categories for each categorical variable. Once the data set was assembled, an exploratory data analysis was undertaken, using various time-series data visualizations in an attempt to identify trends in the variables over the 40-year study period. For the purposes of this study, the scale of the included incidents (number of casualties, financial impact, etc.) was not considered. 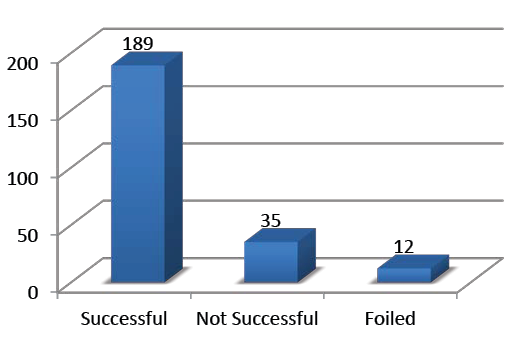 As a result, smaller incidents were given equal consideration to more consequential attacks. This was done in large part to avoid the oversized statistical impact of the 2001 World Trade Center attacks, which would have significantly skewed the results. 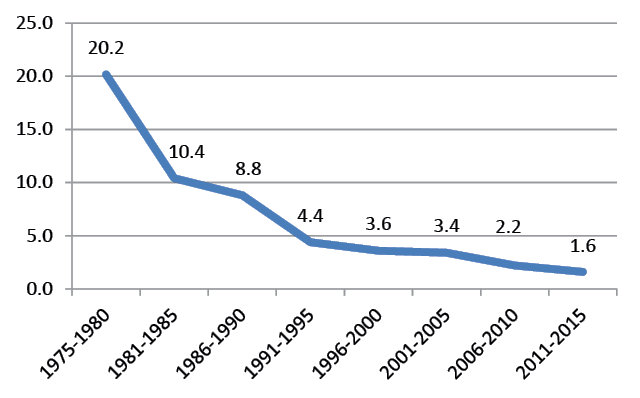 The number of terrorist attacks in NYC has decreased steadily since 1975. 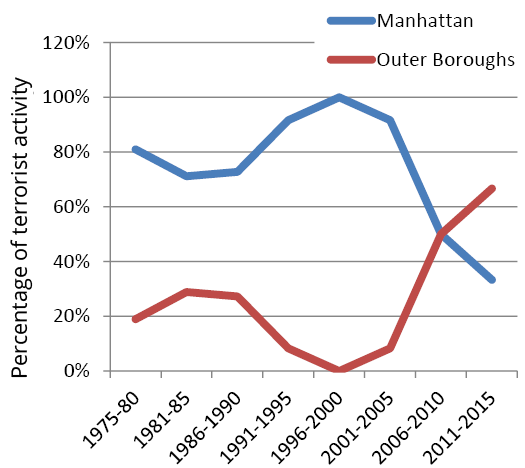 Terrorist activity has become more concentrated in the outer boroughs in recent years. 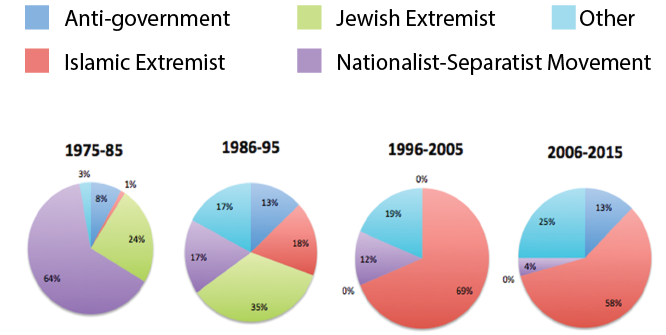 40 years ago, attacks motivated by various Nationalist-Separatist movements were the most common. Today, attacks motivated by Islamic extremism are most common. The incidence of individual attackers is on the rise, while attacks by members of organized terrorist groups are decreasing. Terrorists are using a wider range of weapons, but still rely heavily on explosives. The following sections discuss these findings in greater detail. How many attacks have there been? What parts of NYC are affected? In recent years, terrorist activity has become increasingly located in the outer boroughs, which include Brooklyn, Queens, Staten Island, and the Bronx. Historically, terror attacks have overwhelmingly been located in Manhattan, where they focused largely on the high-profile political and financial targets located there, such as foreign embassies, consulates, major banks, and transit hubs. With the notable exception of the two major airports (both located in Queens), such prime targets are nearly exclusively located in Manhattan, making increased terror activity there unsurprising. However, as the graph below shows, the majority of terrorist activity in the last ten years has been located in the outer boroughs. As uncovered by several recent foiled terror plots, much of the activity in the outer boroughs involves the organization and planning phases of various plots, as opposed to the actual execution of the attacks. These findings confirm that, although the majority of high-profile terror targets (foreign embassies, major banks, etc.) continue to be located in Manhattan, high-risk terror activity is occurring more often in outlying sections of the city. What is motivating the terrorists? These are attacks motivated by various movements that focused on the advancement of a certain political group, often with the goal of establishing a separate state or government. These are attacks motivated by opposition to government forces without the expressed goal of establishing an alternative government. These are attacks motivated by Islamic extremism. While many such attacks also have political goals similar to those of Nationalist-Separatist movements, the primary role of religion in the motivating ideology justifies the creation of a separate category. These are attacks motivated by Jewish extremism. As with Islamic extremism, many of these attacks also have clear political goals, but the primary role of religion justifies a separate category. In order to capture the changing dynamic of specific religion-based movements, the two religion-based categories were not combined into a single category. These are attacks motivated by a variety of other causes that did not fit into any of the above categories, such as anti-abortion and anti-Islam attacks. As there were relatively few of these attacks, they were grouped together. From 1975-85, the majority of attacks were attributable to various Nationalist-Separatist movements, which accounted for 64% of all activity (over 100 attacks).5 While a number of specific nationalist causes claimed responsibility for attacks in this period, the most significant movements were the Puerto Rican Nationalist Movement6, the Croatian Nationalist Movement7, and the Cuban Counter-Revolution Movement.8 Attacks by Jewish extremists9 were also significant in this period, accounting for 24% of all activity. Islamic extremism accounted for only 1% of activity. In the most recent period, from 2006 to 2015, Islamic Extremism increased dramatically, accounting for 58% of activity, while Nationalist-Separatist attacks nearly disappeared, decreasing to only 4% of activity. No attacks were attributed to Jewish Extremism. Individual attackers or members of a terrorist group? In the past, terrorism was largely a group-based phenomenon. In more recent times, however, attacks have been carried out increasingly by individuals working without the direct support of a large organization. As the graph in figure five shows, the percentage of attacks attributed to an organized terrorist group has been largely decreasing, while the percentage of individual attacks is on the rise. In the politically volatile years of the 1970s and early 1980s, several tightly knit terrorist groups carried out the vast majority of attacks. From 1975-80, groups claimed responsibility for 90% of all activity. In contrast, from 2011-15, groups were responsible for only 25% of activity, while individual actors accounted for the remaining 75%. While the scope of this study is limited to a basic statistical overview of historical data, the findings discussed above can have near-term, practical applications in terrorism preparedness efforts in NYC. This may be especially relevant to the efficient allocation of the limited resources available to the local entities concerned with terrorist activity, most notably the NYPD and FDNY. Another potential policy application could address the emergence of individual attackers by adapting investigative techniques to practices that would be more effective at identifying a radicalized individual, as opposed to those focused on identifying group activity. Such practices would necessarily involve fostering a deeper understanding of the radicalization process, which would require additional research to develop effective field-level techniques to address this emerging issue. A third application of this study’s findings could consider the study’s finding of a sharp increase of Islamic extremism as a motivating cause and could seek to develop counterterrorism practices that address any tactics and targets that may be more prevalent in those kinds of attacks. For example, anecdotal evidence suggests Islamic extremist attacks may favor suicide bombings and a goal of maximizing civilian casualties, as opposed to nationalist-separatist attacks, which seem to focus on planted explosives with the goal of destroying high-profile property.14 As the relationship between motivating factors and attack modalities is outside the scope of this study, further research would be needed to investigate this idea. While this analysis offers several insights into the changing landscape of modern terrorism, its findings are specific to one location: New York City. In order to paint a more robust picture, it will be necessary to undertake similar studies for other cities, both domestic and abroad. As a start, further research could include Chicago, Los Angeles, London, and Paris. By comparing the findings of this analysis with studies of comparable cities, we may be able to gain more telling intelligence of the evolving threat of terror. Additionally, further research into this study’s specific findings can and should be pursued. This study was initially undertaken in conjunction with a training initiative aimed at raising terrorism awareness for field units of the FDNY and, as such, does not explore the many possible causal factors that influence its findings. Essentially, this study provides an objective statistical description of the history of terror in NYC – further research could explore the various causes behind the observed trends. For example, further research could explore why the number of terrorist attacks has decreased so drastically. Is this indicative of the effectiveness of counterterrorism efforts, or has the allure of NYC as a target somehow diminished? Such research could be useful in determining the value of specific counterterrorism tactics or tools. In addition to the research suggested in the previous section, one suggested area of further research would be to study the increase of terrorist activity in the outer boroughs, which are largely residential areas. The following questions might be explored. Do the study’s findings indicate that terrorists are now more homegrown in NYC, plotting and carrying out attacks where they live, rather than coming to New York to carry out attacks? Is this phenomenon indicative of increasing effectiveness in counterterrorism investigations, as more plots are uncovered during the planning stage? Does it indicate more public awareness of terrorist activity and more cooperation with the police? Is terrorist activity more likely to be discovered in areas where specific occupancy types are common (residential, commercial, industrial, etc.)? This is of interest as public safety agencies work to effectively allocate limited resources. Another suggested area of future research would be the growing incidence of individual actors, or “lone wolf” attacks. The following questions might be explored. To what degree are these individual actors influenced by larger groups in which they do not have a clear membership? What role does the availability of social media and other electronic communication have in these incidents? This dynamic is especially relevant as the counterterrorism community works to understand internet-based extremism and recruitment, especially as it concerns global entities such as ISIS and Al Qaeda. The world is changing and terrorism is changing with it. But despite the continual evolution of terrorist practices, the local outlook is not as grim as one might fear. In New York City, an ideal target for terrorists of any variety, there are fewer terrorist attacks today than at any point in the past 40 years. Counterterrorism efforts have foiled several plots in recent years and identified aspiring terrorists before they had the capacity to strike. While many factors contribute to such efforts, the role of accurate, reliable information is central to the ongoing fight against terror. This study seeks to contribute to this body of information, however modestly, and to highlight further the growing importance of basic quantitative analysis to the field of public safety, not only in NYC, but in municipalities nationwide. Matt Quinn is a Lieutenant in the FDNY and works at the FDNY’s Center for Terrorism and Disaster Preparedness as part of the Intelligence and Risk Management section. He also works as a fire company officer at Engine 69 in Harlem and is a member of the Planning Section of the FDNY Incident Management Team, specializing in GIS systems. Additionally, Matt is an adjunct professor at Empire State College, where he teaches courses in data analysis. He previously served as a uniformed advisor to the FDNY Analytics Unit and worked as an intern in the NYC Mayor’s Office of Operations. Matt has a Master’s Degree in Public Administration from New York University and a BS Degree in Chemical Engineering from the University of Pennsylvania. He may be reached at MatthewT.Quinn@fdny.nyc.gov. The views expressed in this article are those of the author alone and do not reflect the views of FDNY. 1 National Consortium for the Study of Terrorism and Responses to Terrorism, Global Terrorism Database, (2015): http://www.start.umd.edu/gtd/. 6 Antonio Rafael De la Cova, “A List of FALN Perpetrated Bombing and Incendiary Incidents,” (1997): http://www.latinamericanstudies.org/puertorico/FALN-incidents.pdf. 7 Michael Oreskes, “LaGuardia Airport Bombing Kills More Than 10,” New York Daily News (December 30, 1975): http://www.nydailynews.com/new-york/queens/laguardia-airport-bombing-kills-10-1975-article-1.2454144. 8 Edith Evans Asbury, “Explosion at Center Cancels Cubans’ Performances,” New York Times (December 30, 1978): http://www.nytimes.com/1978/12/30/archives/explosion-at-center-cancels-cubans-performances.html. 9 “Smoke Bomb Disrupts Showing of Soviet Film,” New York Times (November 5, 1982): http://www.nytimes.com/1982/11/05/nyregion/smoke-bomb-disrupts-showing-of-soviet-film.html. 10 David Barstow, “A Nation Challenged: The Incidents; Anthrax Found in NBC News Aide,” New York Times (October 13, 2001): http://www.nytimes.com/2001/10/13/nyregion/a-nation-challenged-the-incidents-anthrax-found-in-nbc-news-aide.html?_r=0. 11 Joseph Goldstein, “Letters Threatening Mayor Tested Positive for Ricin,” New York Times (May 29, 2013): http://www.nytimes.com/2013/05/30/nyregion/letter-sent-to-bloomberg-is-said-to-test-positive-for-ricin.html?_r=0. 12 “Smoke Bomb Disrupts Showing of Soviet Film,” New York Times (November 5, 1982): http://www.nytimes.com/1982/11/05/nyregion/smoke-bomb-disrupts-showing-of-soviet-film.html. 13 Lawrence Altman, “Terror in Tokyo: The Poison,” New York Times (March 21, 1995): http://www.nytimes.com/1995/03/21/world/terror-tokyo-poison-nerve-gas-that-felled-tokyo-subway-riders-said-be-one-most.html. 14 FDNY Center for Terrorism and Disaster Preparedness, “November 2015 Paris Terror Attack Fireguard,” (2015): https://info.publicintelligence.net/FDNY-ParisAttacks.pdf. Jerome M. Hauer Ph.D., M.H.S. Lieutenant Quinn has written an interesting article but his decision to stop his retrospective research in 1975 was unfortunate, From 1970-1975 New York City witnessed a violent time with attacks from the Weather Underground, the Black Liberation Army, FALN and the SLA. These attacks included the murders of Police Officers, bombings, and the use of incendiary devices. The targets included banks, NYPD Headquarters, a police station, a judge’s residence, historic Fraunes Tavern at lunch time and various other targets. Numerous deaths resulted, including the death of Ted Gold, a Weatherman bomb maker, who blew himself up along with two other members of the Weatherman in a Greenwich Village townhouse, an incident i responded to with 5 Engine. These incidents occurred in several boroughs. Had this data been included, the results would have changed and the graphical representation the the data would likewise have been different. This is an excellent point and, while the study would certainly have been more robust if the period from 1970-1974 was included, I don’t believe the results would have been significantly different. According to the START database, there was indeed far more terrorist activity in NYC during this period than any other 5-year period studied (187 incidents), but a cursory look at the data seems to largely point to the continuation of the trends found in the 1975-2015 analysis, though there may have been a higher rate of armed assaults and an increased incidence of anti-government motivation. While the entirety of the activity of the Black Liberation Army and the Weather Underground occurred before 1975, nearly all FALN activity was included in the study, including the Fraunces Tavern bombing. No activity attributed to the SLA was noted in NYC, though other left-wing groups were active. The reason the study did not include 1970-74 was the limited availability of the necessary data for incidents before 1975. The original goal of the project was the construction of an interactive map of incident locations, which required specific addresses of attack locations. The only effective way to gather this data was by way of online newspaper archives, which proved prohibitively difficult for incidents prior to 1975. I understand your comments but the locations of the attacks prior to 1975 were easy to pinpoint. Fire and Police Department records would have provided the locations. Assuming that the results would have not been different is not acceptable as a reason to not include data, it simply limits the quality of the results. Having responded to a number of the incidents during the 70-75 time period, the media reporting of these events was quite specific. I believe your study and the interactive map are a valuable and interesting project and I look forward to your next iterations. Congratulations on the interesting article, I enjoyed it.